This is a non-partisan blog. This blog will cover any Cook County Circuit Court candidate, county-wide or subcircuit. If a judicial candidate has a website, I will link it. Experience has shown that Democrats who win county-wide judicial primaries are almost certain to win election in November. No Republican filed county-wide for the 2008 primary; two Republican candidates filed for one countywide vacancy in 2010. Thus, as a practical matter, there will be a lot more Democratic candidates featured here than Republicans. However, whether Democrat, Republican, Green or Independent -- anyone who can run for judge can get into this blog. This blog does not make endorsements. Of course I know some candidates better than others: I've been in practice 31 years; I can't help but know a few people. When it comes to judicial candidates, however, this blog is about information, not my opinions. When they become available, I will post ratings from the bar associations, newspaper endorsements, and any community group or union endorsements that I can verify. My goal is to help voters to make informed choices based on the data provided here. I want to publicize candidate events. If a candidate has a cable TV appearance, if a candidate has been invited to address a Chamber of Commerce luncheon, or is planning to have volunteers work all morning at the 95th Street Station on the Red Line -- and if that candidate wants some publicity about it, he or she need only let me know. I'll run pictures if they're provided (but see point 5, post). Some candidates will seek more publicity than others, and so may appear here more frequently; this should not be interpreted as suggesting any preference on my part. I am not a professional journalist. I am a practicing attorney. Having run for judge twice myself (in 1994 and 1996) I appreciate just how little time candidates have to get their campaigns in front of as many people as possible -- but the needs of my practice or of my family may slow my response time in given instances. I'll do the best I can. I reserve the right to edit information, to add information I've discovered on my own, to combine or even ignore duplicative releases. In short, I reserve the right to edit. I want these judicial posts to be a resource for voters. That means I want to provide accurate information. Accurate information may not always be the most flattering information for a particular candidate. I will give sources; I will strive to be fair. If a candidate thinks I've been unfair in a given instance, or if I've omitted something material, he or she is encouraged to write me or leave a public comment. An email link is provided in the sidebar. I reserve the right to delete comments. I don't know that comments from friends and family like "he's the best" or "she's the most qualified" are going to really assist or sway any voters -- but I'll leave those comments alone. I also reserve the right not to bother with negative comments. There is probably no persuasive value in anonymous comments of "I hate this person" or "this person is no good;" such comments often say more about the commenter than the candidate. I do, however, reserve the right to intervene if comments turn particularly nasty or personal. Anonymous comments are permitted, but commenters are strongly encouraged to leave a name. Found on the Internet: The campaign website of Judge Pamela M. Leeming. That's a link to the site in the preceding sentence; a link has been added to the sidebar. 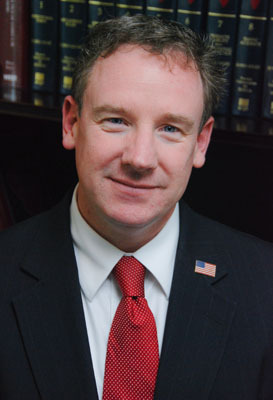 Judge Leeming was initially appointed to the Circuit Court of Cook County in late 2009. She was one of many candidates for an 11th Subcircuit vacancy in the 2010 primary. 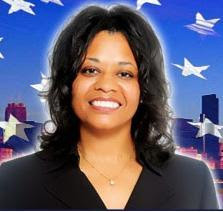 Although she lost on that occasion, Leeming was thereafter recalled to judicial service and was recently slated by the Cook County Democratic Party for 2012. 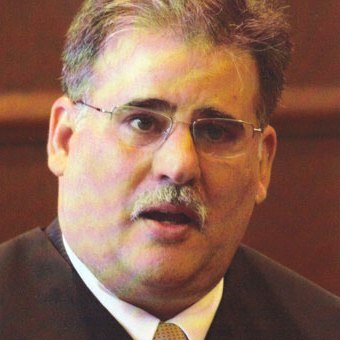 Judge Anthony C. "Tony" Kyriakopoulos, appointed by the Illinois Supreme Court to the Locallo vacancy in Cook County's 10th Judicial Subcircuit in January 2010, has announced plans to seek election to that seat. A campaign website has been established by the Kyriakopoulos campaign. That's a link to the site in the preceding sentence; a link has also been added to the sidebar. The Kyriakopoulos campaign also has a Facebook page. Found on the Internet: A campaign website for Judge Ketki "Kay" Shroff Steffen, appointed by the Illinois Supreme Court to the "A" vacancy in Cook County's 13th Judicial Subcircuit in January 2010. That's a link to the site in the preceding sentence; a link has also been added to the sidebar. Before she was appointed to the bench, Steffen had been a finalist in the 2009 round of associate judge selection. Judge Steffen's website indicates that she will be a candidate in the Republican primary in the 13th Subcircuit. Per email received, a campaign website has been established for Judge Andrea M. Schleifer. That's a link to the site in the preceding sentence; a link has also been added to the sidebar. A fundraiser for Judge Schleifer's campaign has been scheduled for Tuesday, November 15, from 5:00 to 7:00pm at the Union League Club, 65 E. Jackson. Tickets are $100 each but sponsorship levels are available (Supporter - $250, Sponsor - $500, and Host Sponsor - $1,000). For further information, or to reserve tickets, email schleifer4judge@gmail.com. Judge Schleifer was appointed to the 12th Subcircuit Rochford vacancy in November 2010 by the Illinois Supreme Court. Judge Mary Trew, who currently holds the 9th Subcircuit Epstein vacancy pursuant to Supreme Court appointment, was recently interviewed Avy Meyers on North Town News Magazine. With Mr. Meyers' permission, that interview is posted below. Judge Trew was a candidate for the 9th Subcircuit "A" vacancy in 2010; she was appointed to the bench in November of that year. Her campaign website is now online and linked in the sidebar. 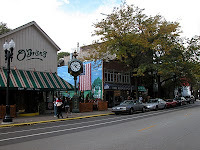 Cook County Commissioner Larry Suffredin and Evanston Mayor Elizabeth Tisdahl will co-host a campaign reception for Associate Judge Larry Axelrood at the Prairie Moon Restaurant, 1502 Sherman, Evanston, on Thursday, November 17, 2011 from 7:00 to 9:00pm. Tickets for the event are $50. Sponsorships are also available (Supporter - $100, Sponsor - $250, and Host Sponsor - $500). Judge Axelrood is seeking election as a full circuit judge from Cook County's 9th Judicial Subcircuit. To purchase tickets, or for more information, contact electjudgeaxelrood@gmail.com or call Thom Mannard at 847-997-3020. The Democratic Party's 8th Judicial Subcircuit slating committee met last Sunday afternoon at Ann Sather's on Belmont. There are four 8th vacancies to be filled in the coming election and the Illinois Supreme Court has appointed judges to each of these. According to 43rd Ward Alderman and Committeeman Michele Smith, the slating committee endorsed three of these appointed judges. They are Judge Celia G. Gamrath (Chiola vacancy), Judge Deborah J. Gubin (Durkin Roy vacancy), and Judge Laura C. Liu ("A" vacancy). No endorsement was made for the Cole vacancy, according to Smith. Judge James L. Kaplan currently holds that seat by appointment. Smith served as vice-chair of the party slating committee. Forty-second Ward Democratic Committeeman John C. Corrigan was the chair of that committee. 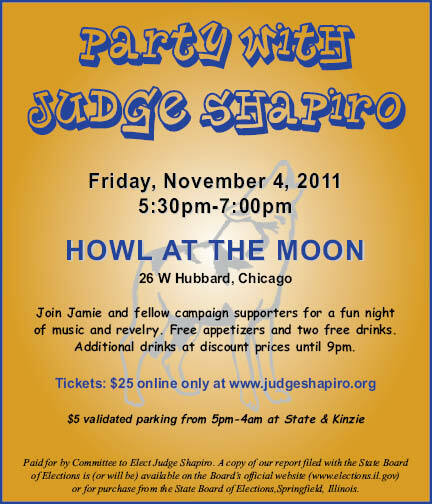 Per email received from Aviva Patt, a fundraiser will be held for Judge James A. Shapiro on Friday, November 4 at Howl at the Moon, 26 W. Hubbard, from 5:30 to 7:00pm. Tickets are $25. The price of admission includes free appetizers and two free drinks. Additional drinks will be available at discount prices until 9:00pm. 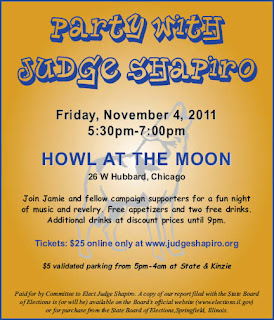 Tickets for this event can be purchased on the events page of Judge Shapiro's campaign website. I couldn't help the play on words after receiving word of Judge Deborah Jean Gubin's upcoming fundraiser: Congresswoman Jan Schakowsky is listed as the headliner for the Sunday, November 6 "Team Spirit Fundraiser" at Brando’s Speakeasy, 343 S. Dearborn, from 11:00am to 1:00pm. Yes, that's ordinarily prime football viewing time, but the Bears won't play until Monday, November 7, when they take on the Eagles in the City of Brotherly Love. Thus the invitation to "Spend Sunday cheering for Judge Gubin." Individual (fan) tickets are $75, but sponsorships are available (Cheerleaders - $150, Linemen - $300, Receivers - $525 and Quarterbacks - $750). 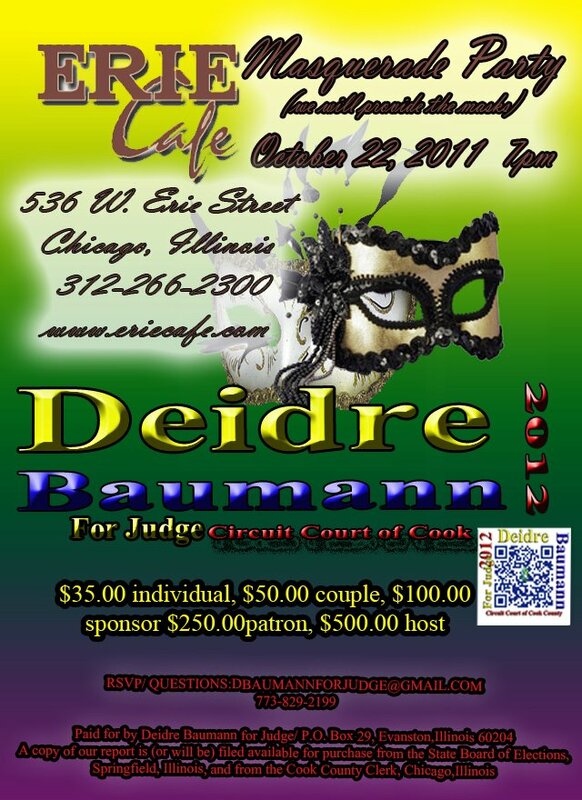 To order tickets, or for more information, call (773) 598-9579 or visit Judge Gubin's campaign website at electjudgegubin.com. UPDATED 10/27/11 to reflect change of event venue. Hat Tip Julie Tuohy. Per email received from the campaign, Assistant Public Defender Beatriz Santiago is launching her bid for the Delgado vacancy in Cook County's Sixth Judicial Subcircuit with the backing of the Democratic Party. Santiago, a lawyer since 1996, says she will be the slated candidate in Subcircuit 6. The campaign has no website at present. A link will be provided when received. Found on the Internet: The campaign website of Nichole C. Patton. That's a link to the site in the preceding sentence; a link has also been added to the sidebar. Patton was a candidate for the Phelan vacancy in the 15th Judicial Subcircuit in 2010; she is apparently contemplating a countywide bid in 2012. According to her website, Patton is an Assistant State's Attorney with the Cook County State’s Attorney Office, Senior and Persons with Disabilities Unit. This would be Patton's second tour of duty with the State's Attorney, where she served as an assistant from 1996-2001. In between, according to her website, Patton was a staff attorney with Liberty Mutual Insurance Company, an associate with Iwan Cray Huber Horstman & VanAusdal and a sole practitioner. 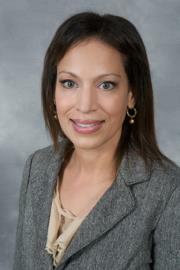 Her website also notes that Patton also served as general counsel for Capital Management Group Securities, LLC. The Patton campaign also has a Facebook page, Elect Nichole C. Patton for Judge. Per email received this evening, family law practitioner Rhonda Salleé has announced plans to seek election to the bench in 2012. A website has been launched in support of the campaign. That's a link to the website in the preceding sentence; a link has been added to the sidebar. Salleé has been an attorney since 1999. 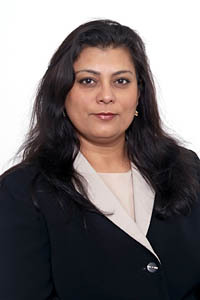 She has served as an attorney for the Forest Preserve District of Cook County, according to her website, and as a staff attorney in the employ of the Chief Judge of the Circuit Court of Cook County, working in the Domestic Relations Division, the Chancery Division, and in the commercial litigation section of the Law Division. In addition, according to the campaign website, Salleé "has successfully maintained her private practice for eleven of the nearly twelve years that she has practiced law." As 43rd Ward Democratic committeeman, one of my roles is to "slate" candidates for nomination in the primaries. Slating is an endorsement and carries with it the expectation that ward Democratic "organizations" help candidates circulate petitions. Slated candidates usually contribute to the Cook County party to share finances for literature and signs. As you know, in Illinois we citizens elect the judges who decide who gets convicted and who goes to jail, who wins the lawsuits, which parent gets custody, and who gets evicted - in short, we elect the people who administer justice in our city. As a former trial lawyer, I have decided to be a voice for merit selection of judges during slating. Of the many judicial races in the 2012 election, I can have the most impact on your behalf in four races: the sub-circuit judges in the Eighth Sub-circuit. How will the slating be done? Judicial candidates have been requesting meetings with me for months, and I have met with everyone who has asked. I review their resumes, their bar recommendations and their list of supporters. There are far more excellent candidates than openings. Because of this surplus of excellent candidates, other factors enter into the decision, including politics. Naturally, each committeeman would like to have a judge who is elected from their ward and best reflects their constituencies. Nevertheless, I intend to advocate to have the most qualified of the candidates receive our endorsement. The slating will be held October 23 at Ann Sather's on Belmont at 3:00 p.m. In the public session, each candidate will receive a brief opportunity to speak and answer questions. Then the committeemen will meet in closed door session to reach a decision. The 43rd Ward Democrats will have its independent endorsement session during the winter, so look for an announcement before the election for our event where you can personally meet the judicial candidates. Editor's Note: A version of this post was circulated by Ald. 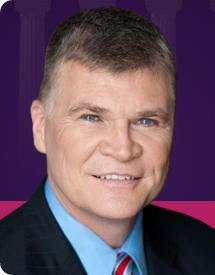 Smith in a constituent email. Who watches the watchers? Or, very loosely translated, for the purposes of this post, who evaluates judges? Per email received this week from the CBA's Therese Kurth, the CBA JEC is looking for members to serve in its Investigation Division. The CBA JEC evaluates both candidates for the bench and sitting judges seeking retention. Applications are available on the CBA website at www.chicagobar.org. Applications should be returned to Therese Kurth via fax 312-554-2054 or by email to tkurth@chicagobar.org on or before October 31, 2011. Current JEC members are not required to reapply. 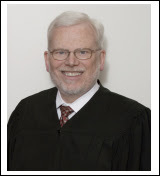 A campaign website has been established for Judge Alfred M. Swanson, Jr. That's a link to the site in the preceding sentence; a link has also been added to the Sidebar. 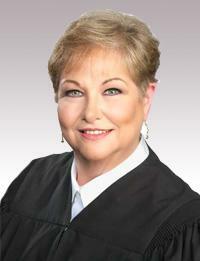 Judge Swanson was appointed by the Illinois Supreme Court to the countywide Ward vacancy. He was recently endorsed and slated for this vacancy by the Cook County Democratic Party. Former Assistant State's Attorney and current Oak Lawn village prosecutor Kevin Cunningham has launched a countywide judicial bid, according to an email received from Lisa Meador. That's a link to the campaign website in the preceding sentence; a link has also been added to the sidebar. Cunningham is a director of the Southwest Bar Association. According to Meador, Cunningham was president of that organization in 2009. Cunningham was not among those recently slated by the full Cook County Democratic Party; however, according to Meador, Cunningham "is endorsed by the 19th Ward." Meador also advises that a fundraiser will be held for Cunningham on November 3, from 5:00 to 7:00pm, at the Sidebar Grill, 221 N. LaSalle Street. Tickets are $100 each. The Southwest Bar Association website advises that another fundraiser be held for Cunningham on October 27, from 4:30 to 7:00pm, at Zante Lounge, 10307 South Roberts Road in Palos Hills. Tickets for that event are $50 each. For additional information, contact info@electkevincunningham.com. A fundraiser to support the campaign of Thomas J. Carroll, recently appointed by the Supreme Court to the McSweeney-Moore vacancy in Cook County's 3rd Judicial Subcircuit, will be held on October 27 from 6:00 to 9:00pm at McNally's, 11136 South Western. Tickets are $35 at the door. For more information or to place a ticket order email mikkicarroll@att.net. An October 24 fundraiser has been scheduled to support Judge Jean Prendergast Rooney's election bid at O'Brien's Restaurant, 1528 N. Wells St., from 5:30 to 7:30pm. The Illinois Supreme Court appointed Judge Rooney to the countywide Jordan vacancy late last year. 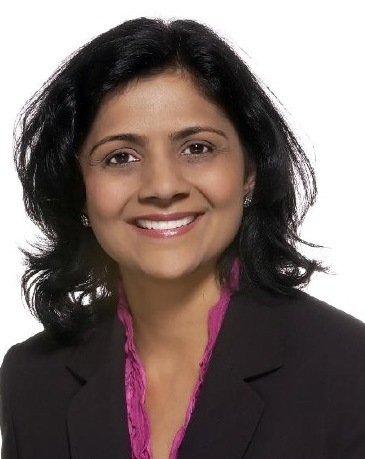 She was a shareholder with Schuyler, Roche & Chrisham, P.C. and the President of the Appellate Lawyers Association of Illinois at the time of her appointment. She was recently slated by the Cook County Democratic Party for a full judicial term. Individual tickets for the fundraiser are priced at $100. Sponsorships are also available (Friend $250, Sponsor $500, Patron $1,000, and Host $2,500). Family law attorney Brad Trowbridge has announced plans to run for judge from Cook County's 8th Judicial Subcircuit. That's a link to Trowbridge's campaign website in the preceding sentence; a link has also been added to the sidebar. Trowbridge's website says that he was a social worker before becoming a lawyer. "After obtaining my MA in Human Development Counseling in 1986," Trowbridge writes on his campaign site, "I worked for many years with disadvantaged people from all walks of life: minority teen mothers, people with HIV/AIDS, and seniors living in poverty. I didn’t sit in an office. I did home visits in places like Cabrini-Green and the Lathrop Homes." Trowbridge became an attorney in 2000. He filed for the countywide McCarthy vacancy in 2010 but withdrew from the race in December 2009. Judge Tom Allen was slated this month for the Locallo vacancy in the 10th Subcircuit. The slating committee, chaired by me and co-chaired by former Alderman Pat Levar, ran a notice in Nadig Newspapers for candidates. When the slating committee met October 1 Judge Allen and Judge Anthony Kyriakopoulos appeared before us. Both judges had been appointed to the bench by the Illinois Supreme Court. Our committee believed both men were highly qualified. Judge Allen got the nod and Judge Kyriakopoulos was named as an alternate. That motion was made by Robert Martwick, Democratic Township Committeeman for Norwood Park and seconded by Levar, Democratic Committeeman for the 45th Ward. The slating committee was made up of Democratic Ward and Township Committeemen whose districts are within the 10th Subcircuit. Other committeemen in attendance included: Patricia Cullerton, 38th Ward; Randy Barnette, 39th Ward; Alderman Pat O'Connor, 40th Ward, and Former Alderman Eugene Schulter, 47th Ward. Those voting by proxy were: Alderman Richard Mell, 33rd Ward; Laura Murphy, Maine Township, and State Representative Lou Lang, Niles Township. bites a dog, that is news." Medical malpractice suits are common (even if they are not as common as some doctors fear). But a suit by a doctor against a patient? That would seem to fit the ancient definition of news. Yet I hadn't heard of Dr. David McKee's defamation suit against Dennis Laurion before I received an email about the case yesterday. Actually, Dennis Laurion was not McKee's patient. Dr. McKee, a neurologist, treated Dennis's father, Kenneth, a World War II vet, who suffered a hemorrhagic stroke in April 2010. The younger Mr. Laurion was not at all happy with how Dr. McKee treated his father. The elder Mr. Laurion survived, but his son felt that Dr. McKee failed to accord his father appropriate dignity and respect. He didn't sue for malpractice; instead, he blasted the doctor on a number of ratings sites. There are ratings services for every business and profession out here on the Internet (including sites that rate lawyers). I haven't used the Internet to check out a doctor since... let's see... yesterday. Usually, though, I'm only looking for confirmation of the spelling of the doctor's name, or to verify an address or phone number. I personally don't put much stock in so-called "reviews." On any random site, some reviews will seem as if they'd been written by the doctor's mother. Others read as if they'd been written by the doctor's bitter ex-spouse. Nevertheless (and understandably), doctors are a bit sensitive about how they are portrayed online. See, "Why doctors hate online reviews," by Dr. Rahul Parikh, in the "Pop Rx" column on Salon.com, September 5, 2011. There are services that promise to provide some protection to the small businessperson who suffers the slings and arrows of outrageous Internet attacks. ReputationDefender is one product that advertises heavily in this market (and the website seems to pitch at doctors in particular); TheReviewBuster.com is another one I found in a quick search today. Public relations firms would, presumably, be able to offer some assistance to the aggrieved professional in straits similar to those in which Dr. McKee apparently found himself. But Dr. McKee decided to sue instead. The trial court entered summary judgment against McKee. The various sources I've consulted today dispute whether Dennis Laurion voluntarily removed his comments from ratings sites when Dr. McKee asked. Depending on the point of view of the poster, McKee's suit was either an honorable response to vicious online attacks or a callous attempt to stifle the Laurion family's free speech rights. And there may have been a SLAPP angle, too: In addition to posting negative reviews, Dennis Laurion made a complaint to the hospital where Dr. McKee worked and to the Minnesota Board of Medical Practice. Supposedly, just before the summary judgment motion was resolved against McKee, a hundred new negative reviews appeared on line about Dr. McKee. McKee's lawyer blamed Laurion; Laurion denied it. I have to wonder whether these additional postings might have been a product of the Streisand Effect. In the course of today's efforts, I do not claim to have peeled through the many layers of conflicting opinion to reveal any hard kernel of truth about this case. The headline on this post, however, "Doctor sues patient’s family — and everybody loses" (HealthExecNews.com, May 10, 2011), struck me as probably accurate. I can report that McKee's appeal is scheduled for a hearing before the Minnesota Court of Appeals, in Duluth, on November 10. Not knowing the actual facts and being unschooled in Minnesota law (and being unlicensed in that state), I venture no prediction about the outcome of the doctor's appeal. But the question arises how a similar suit might fare in Illinois. Would our Citizen Participation Act (735 ILCS §110/1 et seq.) apply? Shoreline Towers Condominium Association v. Gassman, 404 Ill.App.3d 1013, 936 N.E.2d 1198 (1st Dist. 2010), may provide some guidance. Ms. Gassman kept installing a mezuzah outside the front door of her condominium; the homeowners' association kept taking it down, insisting it was prohibited by a policy that prohibited "[m]ats, boots, shoes, carts or objects of any sort... outside Unit doors." Gassman, a lawyer, initiated a raft of lawsuits and religious discrimination complaints with a number of state agencies, challenging the association's ban. The association changed its policy. And, for good measure, the City of Chicago passed an ordinance and the State of Illinois passed a law prohibiting others from attempting similar bans. But relations between Gassman and the Association had soured in the meantime to the point where all sorts of accusations were made by one side and the other. Ultimately the Association filed a 10-count complaint against Gassman alleging a variety of theories. Gassman moved to dismiss all counts under the Citizen Participation Act (or, as it also sometimes called, the anti-SLAPP Act). The trial court agreed that the Act applied to some, but not all of the counts. [T]he Act does not protect only public outcry regarding matters of significant public concern, nor does it require the use of a public forum in order for a citizen to be protected. Rather, it protects from liability all constitutional forms of expression and participation in pursuit of favorable government action. To the extent, then, that our hypothetical Illinois doctor's suit might be seen as retaliation for complaints to licensing authorities, my suspicion is that an Illinois court might find that the anti-SLAPP statute applicable. Maybe. But the anti-SLAPP statute provides no license for Internet trolls out to sabotage a professional's reputation. 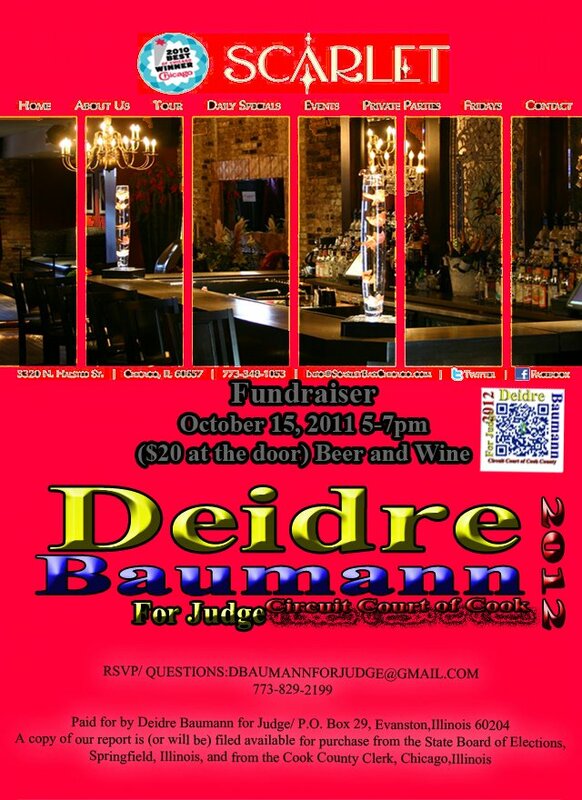 The Deidre Baumann campaign has announced two October fundraisers. As the above poster indicates, the Scarlet Bar, 3320 N. Halsted, will be the site of an October 15 event, which will run from 5:00 to 7:00pm. Tickets are $20 at the door. Baumann's campaign will host a Masquerade Party on October 22, starting at 7:00pm at the Erie Cafe, 536 W. Erie. Individual tickets for this event cost $35, or $50 per couple. Sponsorships are available, as noted on the event poster, below ($100 sponsor, $250 patron, $500 host). The poster also promises that masks will be provided. For additional information concerning either of these events, or to confirm reservations, email dbaumannforjudge@gmail.com or call the phone number on the posters (you can click either poster to enlarge). To access Baumann's campaign website, click here or use the link provided in the sidebar. Forty-second Ward Democratic Committeeman John C. Corrigan has announced that the 8th Judicial Subcircuit Selection Committee of the Cook County Democratic Party will interview candidates seeking the Democratic Party's endorsement for the four 8th Subcircuit judicial vacancies at 3:00pm on Sunday, October 23, 2011 at Ann Sather's Restaurant, 909 West Belmont Avenue, Chicago. This meeting will be open to the press and public. The 8th Judicial Sub-Circuit includes all or part of Chicago's 2nd, 3rd, 11th, 25th, 27th, 32, 40th, 42nd, 43rd, 44th, 46th, 47th, 48th and 49th Wards. Corrigan is the chair of the selection committee. By hand delivery or Mail to John Corrigan, 42nd Ward Democratic Committeeman, 20 South Clark Street, Suite 2900, Chicago, Illinois 60603. Committeeman Corrigan advises that any prospective candidates having questions about the slating should call him at (312) 573-0042. Jean M. Prendergast (appointed by the Supreme Court to the Jordan vacancy). Two non-judges also earned the Democratic Party's endorsement for Circuit Court vacancies. These are Deputy Corporation Counsel Michael A. Forti and Cynthia Ramirez, an Administrative Law Judge for the Illinois Department of Public Health. I've seen nothing, at this point, which establishes the vacancy for which any of these candidates have been endorsed. Additional information will follow when available. Additional coverage: Cook County Democratic Party Slating - 2012 (from Democratic Party of the 49th Ward). Abdon M. Pallasch reports in today's Chicago Sun-Times that a "Cook County Democratic Party committee Wednesday recommended the party endorse Mary Jane Theis for the state Supreme Court in the March primary election." Justice Theis was appointed to the Illinois Supreme Court last year, when Justice Thomas Fitzgerald stepped down. Pallasch reports that the full party is expected to accept this recommendation today and to announce all of its other endorsements for the five First District Appellate Court vacancies and the ten countywide Cook County Circuit Court vacancies that will be up for election today. This blog will try to provide information on these decisions as soon as possible. Footnote: Mr. Pallasch came to the Sun-Times from the Chicago Daily Law Bulletin. It should be noted that Mr. Pallasch is perhaps the only reporter on the Chicago dailies who regularly provides information on the local judiciary. Given the ever shrinking news hole in the Chicago papers, his reporting is more valuable than ever. 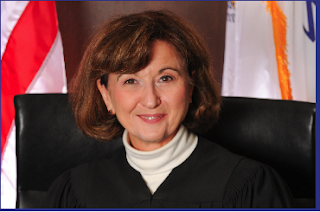 Associate Judge Helaine (Laine) Berger, a candidate for the Cole vacancy in Cook County's 8th Judicial Subcircuit, was recently interviewed by Avy Meyers on North Town News Magazine. With Mr. Meyers' permission, that interview is posted below. 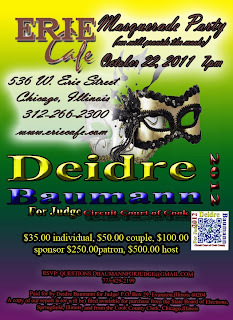 State Senate President John J. Cullerton will headline a fundraiser for Judge Deborah J. Gubin on October 20, 2011, from 5:00 to 7:00pm, at the offices of public affairs and government consulting firm All-Circo, Inc., 670 N. Clark Street, 4th Floor. Food and beverages will be provided at the event. Individual tickets are priced at $100, but sponsorship levels are available (Friend $500; Sponsor $1,000; and Host $2,500). 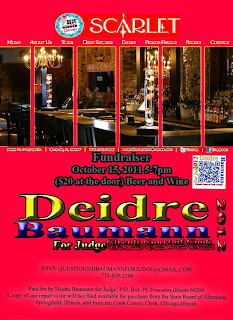 For more information, or to reserve tickets, email Judgedeborahgubin@gmail.com or call (312) 572-9884. Judge Gubin was appointed by the Illinois Supreme Court to the 8th Subcircuit vacancy created by the retirement of Judge Maureen Durkin Roy. 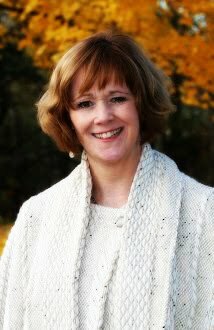 Her campaign website can be accessed at electjudgegubin.com.